Originally written for and published in NetworK. All pictures are courtesy of Joan Doty. ​The vase shape is primarily functional—its purpose​ being simply to hold and display flowers. In general, most Carnival vases are fairly tall and slender, their mouths opening wider to fan out their floral contents to best effect. But within this broad generalization are many differences and of course, there are other vase shapes that don’t fit the “tall and slender” description at all. In the creative process of a swung vase, the pieces were extracted individually from their moulds, clamped on the end of a snap, reheated in a glory hole and literally swung by the glassmaker whilst the glass was still elastic in texture, to achieve their finished length. ​It is this individual reheating—each vase being reheated to slightly different temperatures and in different places—combined with the direction of (and the energy expounded on) the “swing” that makes each vase unique. Just as the camera freezes the dancer in motion, the swung vase captures glass in motion. This is the fascination of swung vases. All Carnival shapes have variation in pattern, in colour, and in iridescence: swung vases have a further dimension—that is variation in form. It is this tremendous variety of form and shape—the way these shapes relate to each other—and with flowers, that continually delights and enchants. Several ordinary vases, grouped together, can create a total sculptural shape that is much greater than the sum of its parts. Even commonplace flowers in the right vase can be breathtakingly dramatic. The picture on the right of Fine Rib vases from Fenton and Northwood illustrates perfectly the variation and the uniqueness in form that was achieved by Carnival glassmakers. Fine Rib swung vases from Fenton and Northwood. It is the diameter of the base, not the height, that determines the size of a swung vase. Above: a trio of Fenton #916 vases. probably to be found in Imperial’s Ripple. ​Vases are attractive: they were meant to be used, and some patterns were produced in great quantities, thus requiring multiple moulds, often in many different sizes which collectors refer to today (in ascending size) as miniature (or mini), small, standard, midsize, and funeral. Base diameters range from 2⅜ to 5⅜ inches, and it is the diameter of the base, not the height, that determines the size of a swung vase. On the left is a trio of Fenton's #916 vases (aka Nine Sixteen, Spearhead and Diamonds or Spearhead and Ribs). The vase was only made in one base size, 3¾ inches, yet the glassmakers were able to swing these vases to achieve an amazing variety of heights. The smallest vase pictured (in blue) is only slightly swung to 7½ inches, whereas the two larger vases (in marigold and blue) were swung to over twice this size, reaching 14 to more than 16 inches. The largest size—the impressive and truly magnificent funeral vase—can achieve the majestic height of 22 inches, weighing 4 to 5 pounds. In their rare, unswung form, these funerals are called jardinières. At the other end of the spectrum, there are diminutive 3-inch high treasures. Swung vases are found in more than sixty different patterns. Most of these patterns were produced only in the vase shape, from moulds designed exclusively for vases. Northwood’s Tree Trunk, Fenton’s April Showers, Imperial’s Ripple and Dugan’s Target are all popular and plentiful patterns found only in the swung vase shape. In addition to occasional whimsies, however, there are some regular production line swung vases from moulds originally designed for other shapes: Fenton’s Butterfly & Berry from a tumbler mould, Fenton’s Blackberry Open Edge from the basket and U.S. Glass’ Palm Beach from the spooner mould. Then there seem to be some all-purpose moulds from which many different shapes were created: vases, rosebowls and spittoons in Millersburg’s Swirled Hobnail and vases, hats, bowls and plates in Westmoreland’s Concave Flute. The Butler Brothers’ catalogues often featured vase selections, such as the one on the left below, from Dugan, which shows a selection of vases from 1913. From the left they are Target, Wide Rib and Pulled Loop, all swung to around 12 inches in height. ribs, loops, and around the top edges. ​The vases are, left to right: Target, Wide Rib and Pulled Loop. ​Some vases were given greater individuality by secondary finishing to the mouths, which was carried out once the piece had been extracted from the mould and swung. The openings may be spectacularly flared, sometimes to a width even greater than the height of the vase, or crimped in a variety of ways, from tight, deeply folded crimping to more continuous and gentle, even crimping. The Jack-in-the-Pulpit (JIP, shown right) shape is especially attractive, being pulled up at the back and open and down at the front. ​Some vases received more than one secondary finish, having both crimping and JIP shaping. Truly many variations on an essentially simple concept. The variations achieved by hand finishing are shown very clearly in the pictures shown above of Fine Rib, #916 and Ripple vases. 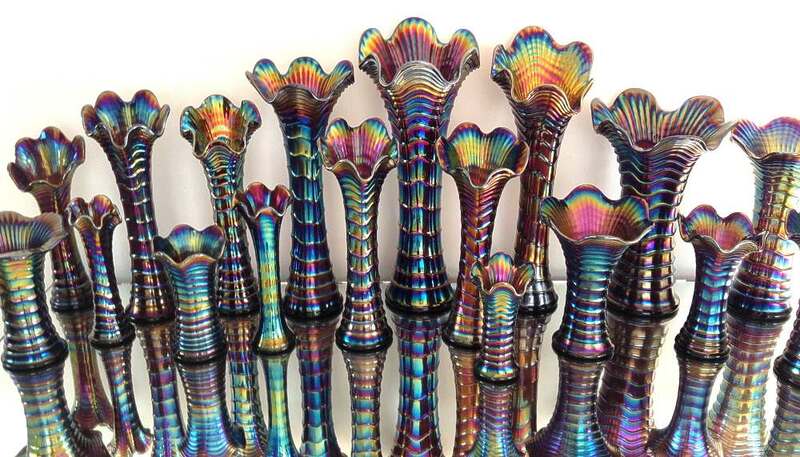 All of this crimping, finishing and indeed, the very swinging of each individual vase required extensive hand finishing of what was essentially mass produced, pressed glass. This seems to have been the provenance of most of the U. S. Carnival manufacturers (the exception being Cambridge, which produced no swung vases). There are a few patterns by Crown Crystal of Australia, but the majority of swung vases were produced by Fenton, Northwood, Millersburg, Imperial, Dugan-Diamond, U.S. Glass and Westmoreland. a splendid ​Jack-in-the-Pulpit shaped top.